Here we report on a 25-year long-term sequence of measures to return a deteriorated recreational urban lake, Alte Donau in Vienna to acceptable water quality. Metropolitan waters require focused ecosystem management plans and intensive in-lake efforts. We explored physico-chemical conditions, food web from viruses to fish and water birds, the sediments, the littoral zone and the catchment, management and urban planning, and global warming. Several restoration techniques were tested and critically evaluated. The final management plan was based on bi-stable theory. During the recovery phase, numerous surplus adjustments had to be implemented to secure sustainable achievement. Illustrations note 46 Illustrations, color; 136 Illustrations, black and white; XIII, 407 p. 182 illus., 46 illus. in color. 1. Concepts for restoration: Nutrient loading, thresholds and alternative stable states.- 2. From a river to an urban lake. Historic development.- 3. Morphology, water temperature and climate.- 4. Hydrological aspects of Alte Donau.- 5. Restoration and lake management.- 6. Long-term changes of the physico-chemical conditions in Alte Donau.- 7. Sediment.- 8. Wax and wane of macrophytes.- 9. The signature of Phytoplankton in Alte Donau: response to trophic change from hypertrophic to mesotrophic over 22 years.- 10. Phytoplankton photosynthesis and production.- 11. The response of zooplankton to restoration and climate warming in Alte Donau.- 12. The Ciliate Assemblage in Alte Donau.- 13 Microbial and viral loop in Alte Donau: A case study.- 14. The effect of restoration measures on the benthic invertebrates of a Danube backwater (Alte Donau).- 15. Fish assemblages of the `Alte Donau' system: Communities under various pressures.- 16. The stocks of waterbirds on the Alte Donau in Vienna.- 17. Hygienic aspects of a recreational water-body.- 18. Restoration of the littoral zone.- 19. New planning activities in Vienna's water-management.- 20. 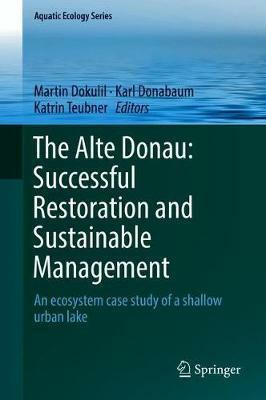 Eutrophication, management and sustainable development of urban Lakes: General considerations and specific solutions for Alte Donau - A Synthesis.